20 reusable cloth wipes great as diaper wipes, for baby faces, wash cloths or personal wipes. Great size to cover your hand. When folded these will fit nicely into a wipe container or warmer. Wet your wipes as needed, or wet with a solution of water, baby wash, and tea tree oil and store in a wipes container. Wash with your cloth diapers. 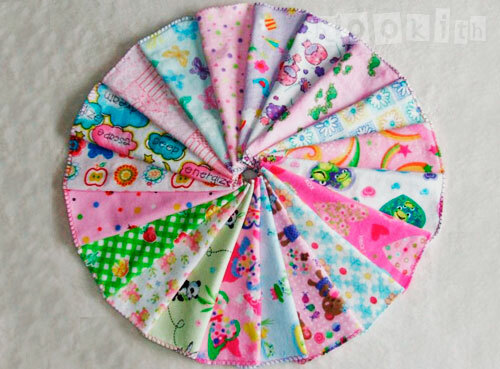 These make great wash cloths for babies and children! These cotton wipes are made from 100% cotton flannel, and have been preshrunk. This means that the owner, Sheila, had already washed the fabric when it was brand, ensuring that the wipes will not shrink in future washes. The wipes were initially marketed for babies and intended to be used as cloth diaper wipes or baby wipes, but I bought them to be used as face wipes, cloth pads and cloth pad inserts. I’ve used them as face towels, to wash my face with water. However, Sheila has informed me that based on her customers’ experience with the cotton rounds (which are made of the exact same 2-ply cotton flannel fabric), these can be used to remove makeup and mascara without staining. As cloth pads/cloth pad inserts, they are quite absorbent but I tend to only use them mid to end cycle. In the above photo, the wipes have been folded in half. I usually fold them into three, the exact size to sit snugly on my underwear or inside all-in-one pads. Folding the wipes into three layers also help increase the absorbency of the pads/inserts. I have machine-washed these wipes at least 50 times! With these 100% cotton cloths, the more they are washed, the more absorbent they become. They are super soft and the fabric has not shrunk or faded. JANFEB12 will give 10% off at checkout. This offer expires March 1, 2012. Hi Kookith. I remember you mentioning about this company and made a mental note to check them out at that time, but of course my mental note isn’t working properly (must’ve ran out of ink) and I forgot. I’m going to check it out (have the page opened right now). Thanks for the discount code! LOL You’re most welcome, LT.